visitor at the recent Government and Nonprofit Career Fair at the University of Minnesota's Coffman Union. 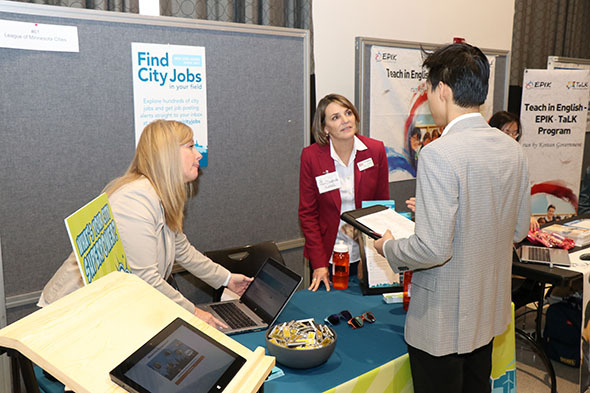 The League is adding a new skill to our résumé and setting up shop at a variety of upcoming career fairs to promote city employers, the value of city careers, and the great opportunities that our member cities can offer job seekers. This work is in response to a call from city leaders to help address the challenge of recruiting for some positions within city operations, as well as your interest in having broader visibility among diverse candidates. Mikacevich test out the booth before the first career fair. lookin' booth, plus handouts that introduce why city careers are a great way to make a difference in your community, how to use www.lmc.org/cityjobs and get started with NeoGov to receive job listings, and what candidates need to know about interviewing to help get their first impression right. Visitors to the booth can check out the jobs site and take the Discover Your City Superpower quiz too, depending on the event. 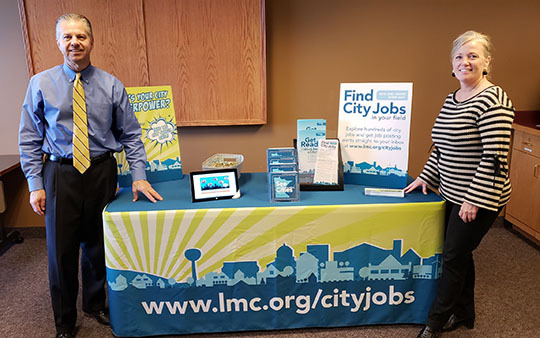 The goal is to prompt more qualified applicants to consider city job postings from across the state, and to leave a great impression about city careers with everyone else. This effort is consistent with some of our other projects over the past year, including our Discover Your City Superpower booth at the state fair, as well as a series of ads we ran on public transit for the duration of the fair promoting the jobs site. Thanks for commenting on the League of Minnesota Cities blog! If you leave a comment using the Anonymous category, please feel free to sign your first name and city. The League of Minnesota Cities is a membership organization dedicated to helping cities throughout Minnesota build quality communities through effective advocacy, expert analysis, trusted guidance, and collective action. The League serves its more than 830 members through advocacy, education and training, policy development, risk management, and other services. For more information, visit www.lmc.org. Do you have a comment? Would you like to venture a guess on one of the trivia questions we put forth? Please do so by clicking the "Comments" link at the bottom of any given blog post. Thank you in advance for respecting our organization's comment policy. Has a particular post caught your eye? Use the tiny, square icons at the bottom of each entry to share it with others via email, Twitter, Facebook, or even your own blog!